An eclipse of the triple moons causes strange behavior in the creatures of the Land of the Lost. I've placed "Jungle Girl" ahead of "Shung the Terrible" in the chronology because at the beginning of "Shung the Terrible" it is stated that Christa has already told the Porters that she doesn't know how to escape from the Land, which we see revealed here in this episode. At 4:39 in the episode, Tom seems to notice Annie coming up behind him but lets her sneak up to him anyway. Sneaking up on her father, Annie covers his eyes from behind to play Guess Who? Going along with the gag, he guesses first Madonna and then Michelle Pfeiffer. It would have been more amusing to have him guess Cybil Shepherd, actor Timothy Bottoms' co-star from probably his most well-known work, The Last Picture Show. But I suppose Cybil wasn't that familiar to young audiences of the time. At 5:16 in the episode, Tom scratches Tasha on the neck and she thumps her foot on the ground just like a dog would. 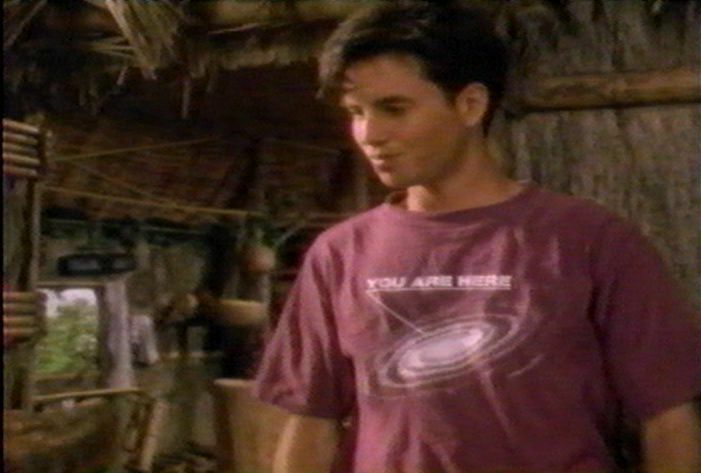 In this episode we see Kevin wearing a t-shirt with an image of the Milky Way galaxy and an arrow pointing to the location of Earth labeled "YOU ARE HERE". Ironically, since they are in the Land of the Lost, the Porters may not even be in the same galaxy! 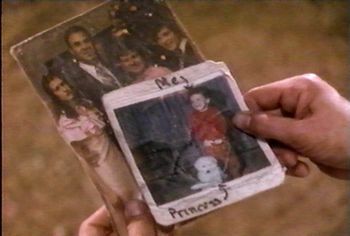 At 11:00 in the episode, we see some photos of young Christa and her family on Earth. In one of the photos is a dog who appears to be named Princess, though Christa does not seem to remember it and cannot read the words. Despite that, it seems she has subconsciously recalled the name and applied it to her "pet" Triceratops, also named Princess. At 11:14 in the episode, Stink is seen picking insects off himself and eating them as apes do on Earth. Christa explains she does not remember her family, but has dreams about the people in the photos. At 13:29 in the episode, Stink looks up at a hole in the ceiling in one chamber of his and Christa's cave home. Might this hole indicate that this cave was formerly a Sleestak crystal chamber similar to the one the Porters will discover in "Kevin vs. the Volcano"? The crystal chamber also has a ceiling hole that allows in sunlight which seems to activate the giant crystal within. If this is the case, what happened to the crystal pillar that should be in this chamber or Christa's cave? 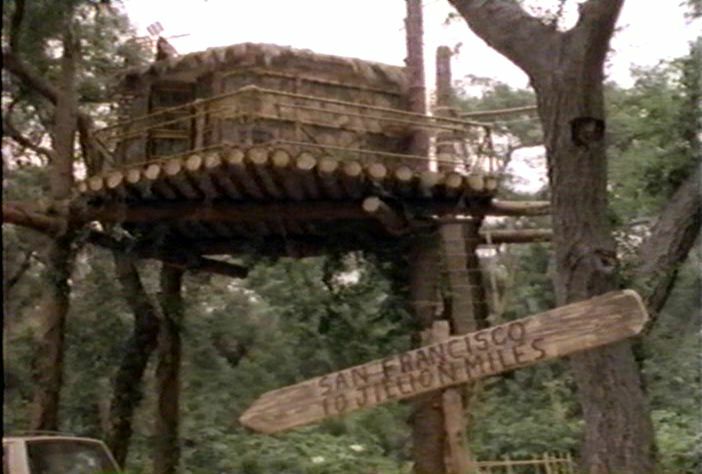 The Porters have an arrow-shaped sign posted outside the tree-house that reads "San Francisco 10 Jillion Miles." "Jillion", of course, is a slang term used for an indefinite, large, fictitious number. During the dinosaur stampede we see a tyrannosaur that looks a lot like Scarface except this one is missing the scar. 2:51 Stink says, "Acuba ne." "Acuba ne" is a Pakuni term used for both "greetings" and "farewell"; in this case, "Greetings." 2:53 Christa says, "Acuba ne, Stink." "Greetings." 2:56 Stink says, "Tau fay cubalu?" "What is wrong?" 9:16 Christa says "zukanay". "calm down"
9:36 Christa says "anoma". "stop"
13:13 Christa says, "osu". "water"
14:13 Christa says, "woomay" "it's me"
14:20 Christa says, "zukanay" "calm down"
14:32 Stink says "Sabuniga" "Sabuniga" is the Pakuni name for the Valley of Death. 21:25 Stink and Christa say "acuba ne" "Greetings." 21:59 Tom and Christa and Stink all say, "acuba ne." "Farewell."